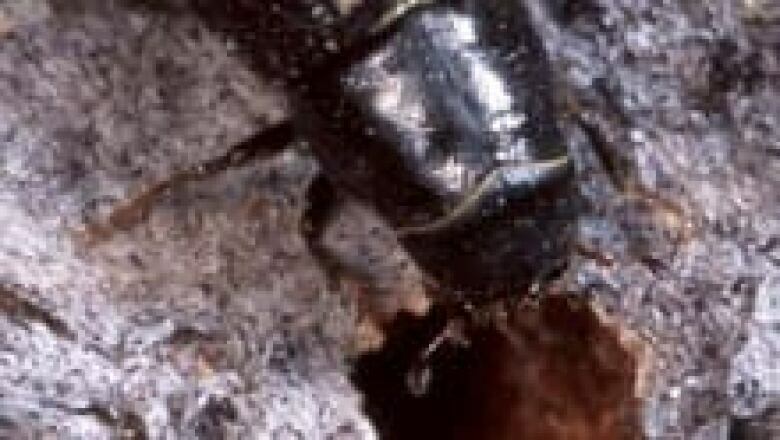 The mountain pine beetle — having already destroyed 18 million hectares of B.C. forest — is on the move to higher elevations and threatening new species of trees, according to a new study. The mountain pine beetle is on the move to higher elevations and threatening new species of trees and entire sensitive forest ecosystems, according to a new study. The resilient beetle has wreaked havoc mainly on lodge pole pine in B.C., ruining 18 million hectares of forest — the equivalent of about five Vancouver Islands. Researchers at the University of Wisconsin-Madison say the bug is now attacking whitebark pine forests in the northern Rockies in the western U.S. and B.C. "These whitebark stands are very fragile, high elevation ecosystems. Very slow growing tree," said Ken Raffa, who led the study. The trees don't have much economic value, but are considered ecologically valuable. Staffan Lindgren, an entomologist at the University of Northern B.C., said he’s concerned about the impact the insect’s destructive migration could have on grizzly bears, who rely on the whitebark pine. "Their seeds are the main over-wintering source of energy for grizzly bears. They're important in terms of hydrology. They're important in terms of serving as nurse trees for other trees coming up behind. They play an important role in containing the snow pack," Lindgren told CBC News. While researchers say it’s difficult to predict if there will be another epidemic, a warming climate means the hardy beetle will likely find more new trees to eat.